The Türkic toponyms are recorded not only in the northern, but also in the central and southern areas of the Middle Asia. Between Samarkand and Huttalan is a mountain area al-Buttam or Buttaman [Hudud al-Alam, p. 115] to which belong the cities Khojend and Ustrushana [Biruni, 1973, p. 471]. In the Sogdian documents it is mentioned in the form pyttm'n, it is a loan from the Sogdian and belongs to the ancient Sogdian toponymic layer [Smirnova, 1961, p. 223]. In Ustrushana are mentioned the city Dizak [Hudud al-Alam, p. 115] and settlement Gazak [Hudud al-Alam, p. 115; al-Idrisi, vol. 8, p. 702], with the names formed with the affix -aq. On the border of Ustrushana with the Samarkand area is mentioned the city Yarkat [al-Istakhri, p. 322; Ibn Haukal, p. 499; al-Moqaddasi, p. 279; al-Samani, p. 596 R; Yakut, vol. 4, p. 1001], with the name’s etymology from the jar ‘‘deep gorge, ravine’‘ [Lurie, 2003, p. 198]. The same was called one of the Samarkand quarters [al-Samani, f. 596 R]. The city with the similar name, Yarkand, was also in the East Turkestan. In the Ustrushana is also mentioned the city with name Arkand [al-Istakhri, p. 335; Ibn Haukal, p. 515]. One of the Ustrushana rustaks was called Masha [Ibn Haukal, p. 505; al-Moqaddasi, p. 265] in which name is noted the modern toponym Match [Cornu, 1985, p. 168]. In the Okuz-Oguz country one of the cities also had the name Masha [al-Idrisi, vol. 4, p. 510]. No similar names were found in the Sogdian language [Lurie, 2004, p. 148]. On the basis of the Türkic language also can be traced the etymology of the toponyms Havas [al-Istakhri, p. 337, 343; Ibn Haukal, p. 462, 505, 516, 521; al-Moqaddasi, p. 342] and Sabat [al-Istakhri, p. 326, 335, 343; Ibn Haukal, p. 461, 463, 503, 521; al-Moqaddasi, p. 49, 265, 277, 290]. The name Sogd (Sugd) had etymology traced from the Avestan sugtha (sukhtha) or ancient Iranian sugud (suguda), which literally meant ‘‘burnt’‘, i. e. the country ritually cleared with fire [Khromov, 1989, p. 89; Grantovsky, 1975, p. 85], and also from the Pehlevij swlyk ‘‘merchant’‘, ‘‘dealer’‘, from which is formed toponym Sula [Tremblay, 2004, p. 133]. It is also hypothesized that the name Sutd is a calque of even more ancient toponym Turan, which origin is linked with the Eniseian-Ket word tur- (tul-) ‘‘pure’‘ and a suffix -en [Yailenko, 1988, p. 132; 1990, p. 41-42], or with Ossetic sugdak ‘‘sacred’‘ [Menges, 1979, p. 132]. The name of the city Samarkand has etymology traced from the Avestan Zmar-kanta ‘‘hidden under ground’‘, or the Sogdian Smara-kanta ‘‘stone’city’’ [Tremblay, 2004, p. 130-131]. In the 11th century it was thought that the name of the city comes from the Türkic Semizkand, which means ‘‘fat city’‘ [Biruni, 1973, p. 471; Kashgari, vol. 1, p. 330]. Per the legend, Samarkand was named after its founder, a Yemen king Samar ibn Afrikish (Shamar ibn al-Haris) [Kandiya, p. 240-241; Mahmud ibn Vali, p. 53], or a Türkic khan by the name Samar [Abu Tohirhoja, p. 16]. On the European maps of the 13 century is mentioned the city Samarcha or Samarcan in Hazaria [Chekin, 1989, p. 8-10]. The name of Samar or Samur during the Middle Ages also carried the river in the western Urals [Ibn Fadlan ‘‘Travel’‘, p. 66; Shomiy, p. 161], city (Samur) in Turkestan [Hudud al-Alam, p. 88], the river in Elburs mountains (Samur) [Yazdi, p. 1666], and the right tributary of the river Selenga (Samar or Samur) in Siberia [Rashid ad-din, vol. 1, p. 176; al-Bakuvi, p. 107]. The name of this river (Samar suyi), like the other rivers of this region (Yaik, Ijik, Idil, Ertish, etc. ), most likely have Türkic origin. The origin of this hydronym has etymology from the Türkic ethnonym Subar with phonetic variations Suar, Sumer, Samar, Savir, Sabir, Sibir, etc. [Zakiyev, 2002, p. 425-432]. The Uralo-Altai peoples of the Middle Asia, Ural and Siberia have an ethnonym Saman/Shaman/Samai/Samar, with the origin traced to the southern regions, from where it was brought the Altai linguistic community in the extreme antiquity [Vasilevich, 1965, p. 139-145]. During the Middle Ages Samarkand was also called Yariyan [Baevsky, 1980, p. 86]. In the ancient Türkic language the word yar meant ‘‘ravine’‘, ‘‘rift ‘ [Kashgari, vol. 3, p. 156, 309, 366]. During the Middle Ages on the southern bank of the lake Issik-kul (Issyk-kul - Translator’s Note) is mentioned a city Yar, which was a capital of the leader of a Djikil (Chigil, Jigil - Translator’s Note) tribe [Karaev, 1987, p. 33]. Samarkand also had a name Fil [at-Tabari, ser. II, p. 1240]. The same name in the pre-Islamic time had the fortress Fir (Fil) in vicinity of the Kat in Khoresm [at-Tabari, ser. II, p. 1238, 1239, 1281; Biruni, 1957, p. 48]. The medieval sources mention in the Samarkand city a bazar called Sikaya-Bashi [Khadr, 1967, p. 317], and also quarter Kaidjundak [An-Nasafi, p. 345] which name on the structure is tri-partite 75 and is formed according to rules of word-formation, typical for Türkic languges76. In the middle component of this name can be seen the Arabic word djund ‘‘soldier’‘. 75 This word consists of three components: kai- (prefix), djund (basis) and -ak (ending). 76 In Türkic languages is a number of words formed by this recipe with the ending -ak: argumchak, kogurchak, kizgaldak, chakalak, bogursak, chakmak, etc. During the Middle Ages in Samarkand was a street Kausakan along the wall (hait) [An-Nasafi, p. 402], which is also mentioned in the wakf document of the 15th century in the form Kusakha [Samarkand documents, p. 190]. The name of this street is formed from an Arabic word kusa, which belongs to the category of the terms used for description of prominent features in the appearance of people, and was used in reference to the men who did not have facial hair (beards and moustaches) and body hair 77. Possibly, the majority of inhabitants of this street were people with a nickname Kusa. It is known that the absence of the body hair is one of the prominent features of northern and eastern peoples, and in particular the Türks 78 (however, the hairless Türks do not have body hair, and hairy Türks do have body hair - Translator’s Note). Hence, this quarter could be founded and occupied by the Türks who lived there during the Türkic Kaganate epoch, whose numbers grew subsequently by the arrival of the natives from the Isfidjab, Farab, Taraz and Kardar 79, and from the 11th century, when Samarkand was transformed into a capital of the Karahanid state, the inflow of the Türks from the Balasagun, Kashgar, Hotan, Yarkand and other Eastern Turkestan cities 80. 77 During the Middle Ages the presence of a beard and moustaches was one of the main criteria, defining a man as a devout Moslem, and distinguishing him from the woman. The absence of the facial hair was naturally deemed among the shortcomings of a man, and was noted alongside with his other features under a special term kusa, like the other features, blind, one-eyed, red-cheeked, tall, thick, etc. The composition of as-Samani gives biographies of several scientists in Merv, Basra and other cities, with a nisba al-Kausadj, i. e. Hairless. In the 12th century one of streets in Merv was called after one of them al-Kausadj Street. (as-Samaani, vol. 10, p. 494). 78 This feature can be observed between many peoples of the Middle Asia, Siberia and East Asia. However in this case apparently the object are the Türks, because of all these peoples only they played an essential role in the history of the Middle Asia in the pre-Mongolian period, and, hence, could constitute a part of the population in the medieval Samarkand. 79 It is known that Türks were a significant part of military forces, court officials and the whole administration in the Samanid state. 80 In the Abu Hafs composition were given biographies of a number of scientists, natives of Isfidjab, Taraz and other Türkic cities, living in Samarkand. One of the Samarkand quarters was called Varsanan or Varsanin [An-Nasafi, p. 195; al-Samani, f. 596 R], like gates in the rabad wall [al-Istakhri, p. 317]. In the Samarkand document of the 16th century the quarter Varsin is mentioned as located in the Samarkand suburb of the Temurid time [Samarkand documents, p. 346]. The settlement with the same name is mentioned in the Nasaf area [al-Samani, f. 580 R]. The origin of this toponym, like the toponym Varsan in the Azerbaijan [Masoudi, vol. 2, p. 75; Abu Dulaf Second note, p. 37], Can be related with the Türkic ethnonym Vare (Varsak/Varsag) [Mirza-zade, 1988, p. 97-100] (per L. Gumilev, a component of the 6th c. Avar flight to Europe - Translator’s Note). The name of the Gatifar quarter in Samarkand [An-Nasafi, p. 200; as-Samani, vol. 7, p. 10; Khadr, 1967, p. 326] is connected with the name of the Ephtalite leader Gatifar. 81 These southern gates of Kesh were called Bab al-Kassarin, i. e. the Gate of Cleaners [Ibn Haukal, p. 501]. The‘‘Sui-shu’‘ tells about an owner of the Kan state (Samarkand) who lived in the city A-lu-di, located on the river Sa-bao [Bichurin, 1950, vol. 2, p. 281]. The name A-lu-di can be read as Alukdik [Bernshtam, 1951, p. 74]. In the Tonyukuk monument is mentioned Bangilak mountain, where lived ‘‘son of Tinesi’‘, i. e. the owner of Sogd [Malov, 1951, p. 69]. With a Türkic word tuz ‘‘flat, plain’‘ [DTS, p. 602] can be connected the names of the settlements Tuz [as-Samani, vol. 3, p. 102] and Tusikas [Boboyorov, 2005, p. 126], with an ethnonym Tuhei [Boboyorov, 2005, p. 126] can be connected the city Tuhsandjkat in the Samarkand province [as-Samani, vol. 3, p. 105]. The name of the Samarkand settlement Farruhshaz [at-Tabari, ser. II, p. 1540] could be connected with a Türkic title shaz 81. The etymology for the name of the city Ishtihan, located in the Samarkand province [at-Tabari, ser. II, p. 1441; al-Istakhri, p. 316, 323, 343; Ibn Haukal, p. 461, 463, 521], was derived from the Sogdian 'sty- (third) and Avestan khaniya (house) [Tremblay, 2004, p. 125], which is little convincing. With a greater probability it can be related with the Türkic name Ishtihan 82 or Ishtahandj 83. 81 The title shaz (shad), formed from the same root as the title ihshiz (ihshid), possibly of the ancient Iranian origin, during the Early Middle Age epoch was mainly used among the Türks. 82 The name of one of the Türkic Hakan’s military leaders [at-Tabari, ser. II, p. 1598]. 83 The Arabic sources mention a military leader by the name Hashim ibn Istahandj (Ishtahandj), who in the 153/770 lead the anti-Chalifate revolt in the Northern Africa [at-Tabari, III, p. 369; al-Djahiz, p. 64]. In the Samarkand province the sources mention the city Zarman [al-Istakhri, p. 334, 343; Ibn Haukal, p. 515; al-Moqaddasi, p. 342; Ibn Khordadhbeh, p. 26; Kodama, p. 203; Hudud al-Alam, p. 113] and Naukand [al-Samani, f. 571 V], in the name of the Naukand is the Türkic topoformant -kand [Lurie, 2003, p. 199]. In the Samarkand was located the Harluh Ordu mint, functioning in the 423-428/1031-1037 during Karahanid Ali-Tegin. There were minted the silver dirhems and copper felses [Fedorov, 1972, p. 358-360]. The name of the settlement Kum, near which was located citadel of the afshin Panch Devashtich [at-Tabari, ser. II, p. 1447], and the name of a small left tributary of the Zarafshan, comes from the Türkic word kum ‘‘sand’‘. The toponym Bukhara is for the first time mentioned on the earliest copper coins of Bukhara with Sogdian inscriptions (4-5th centuries) [Naimark, 1995, p. 37] in the form Pugar (pwgr) [Smirnova, 1982, p. 143] or Puhar (pwkh'r) [Smirnova, 1981, p. 34 (№ 792-796)], and on the coins with the Horezmian inscriptions (6th century) Pukar (pqr) [Muhammadi, 2000, p. 91]. In the Sogdian sources (beg. of the 8 – 9th centuries) are also present the forms Pugar (pwg'r) and Puhar (pwkh'r) [SDGM, p. 182; Henning, 1940, p. 10], and in the Kül-Tegin inscription (beginning of the 8th century) it is in the form Buqar [Malov, 1951, p. 19-20]. It was suggested that this name comes from the Sanskrit word vihara, which means ‘‘monastery’‘ [Frye, 1956, p. 106-119]. However, by the norms of the Sogdian language, the name Puhar could not be transformed from the word vihara, for which in Sogdian is used the word barkhr [Lurie, 2004, p. 20]. In the Persian language this word is rendered in the form farkhar [Baevsky, 1980, p. 88] or bikhar [Hudud al-Alam, p. 27а; Hudud al-Alam, p. 108], and in the Arabian it is rendered in the form, al-bakhar or al-bukhar [al-Khowarezmi, p. 34]. Hence, a spelling pwkhr renders the name sounding as bukhar (bugar , buqar) or pukhar (pugar ), formed from a non-Sogdian word [Tremblay, 2004, p. 122], and probably, of the Ephtalite origins [Livshits, Kaufman, Diyakovov, 1954, p. 155, 157]. The Enisei languages (Hanty) have a word pukhar (pukhyr), which means ‘‘island’‘ [Murzaev, 1984, p. 470]. In this respect are of interest some sources which can shed light on true origin of this word. Per Djuvayni, the word Bukhar, underlying the name Bukhara, in the language of Mugs meant (bа-lugat-i mugan) ‘‘the assembly of science’‘ (maima-i-ilm), and in the language of Uigur and Chinese idolaters ((bа-lugat-i but -parastari), was used for their temples, where their idols (maabid ishan ke mawzi-i butan) were located. Therefore this city was named Bukhara, and in the past it was called Bundjikat [Juwayni, vol. 1, p. 76; Bartold, 1963 (а), p. 214]. In the ancient Uigur language the word Bukhar meant ‘‘temple’‘, ‘‘chapel’‘ [Budagov, 1869, vol. 1, p. 285]. Mahmud Kashgari notes that the city Bukhara was named so because was a temple of idolaters [Kashgarli, p. 111; Kashgari, vol. 3, p. 164]. This shows that the name of the city Bukhara could be formed from the word bukhar which is not Sogdian, but a Türkic (Uigur) vocalization of the Sanskrit word vihara (Buddhist monastery). It is known that in the 6th century the Bukhara oasis was a possession of son of the Supreme Türkic Kagan Istami-Kagan (Kara Churin) by the name Tardu-Kagan (Save-Shakh, Shir-i Kishvar), who was a maternal uncle of the Sasanidshahanshah Hurmazd IV Turkzade [Belami, vol. 2, p. 248, 265; Firdousi, vol. 6, p. 656 - 657], because he was a first brother of the Istami-Kagan daughter, who married the Sasanid shahanshah Hosrow I Anushirvan. He ruled in Bukhara for 20 years, with his residence in Baikand, and has built the Bukhara shahristan, and also a few settlements in the Bukhara oasis. His son Il-Tegin (Parmuda, Nili-Khan) also founded a few settlements in the Bukhara oasis, such, as Iskidjkat, Sharg, Farahsha and Ramitan. He was married to the Chinese princess, who brought with her from China a temple of idols, and it was installed in the Ramitan [Frye, 1954, p. 8; Narshahiy, p. 16-17]. Ramitan was older than Bukhara, and earlier the kings resided there, and after erection of Bukhara they moved to the new city. In some books Ramitan is also called Bukhara [Frye, 1954, p. 16; Narshahiy, p. 23]. On the map of the Bukhara city and its vicinities, made in the middle of the 19th century, is mentioned the tomb of the son of a Chinese king (kabr-i pisar-i hita) [Muhamedjanov, 1965, p. 34], from which follows that the the Chinese princess spent the last years of her life in Bukhara (from which also follows that the mausoleum that survived 1,200 years before the Russian conquest, did not survive the 150 years of the enlightened era - Translator’s Note). During the Middle Ages in the Nasaf area is mentioned the settlement Naukad Sava [An-Nasafi, l. 59а; al-Samani, f. 571R], which name can be connected with the name Sava (Save). The Supreme Türkic Kagan Tardu (Shir-i Kishvar) in the Arabic sources is called Shaba [Ibn Khordadhbeh, p. 40], and in the Persian sources is called Sava-shakh [Firdousi, vol. 6, p. 656-658; Gumilev, 1969, p. 115, 132]. Sava or Shava (Sawa) is a Baktrian title, meaning ‘‘king’‘ [Frye, 1956, p. 122; Harmatta, Litvinsky, 1996, p. 371]. From this follows that Shir-i Kishvar founded settlements not only in the Bukhara province, but also in the Nahshab province. In the 10th century it was believed that in the olden times the central city of the Bukhara oasis was called Numidjkat or Bumidjkat [al-Istakhri, p. 313; Ibn Haukal, p. 463; al-Moqaddasi, p. 40, 289; Narshahiy, p. 27, 63]. It is suspected that the old name of Bukhara was Navakmetan [Grene, 2006, p. 35]. Hence, the name ‘‘Bukhara’‘ is not very ancient and most likely belongs to the early Middle Age toponymic layer. Therefore some settlements of the Bukhara oasis, such as Baikand, Varahsha, Vardan, Ramitan and Ramush, are considered to be older than Bukhara [Narshahiy, p. 16, 23-25; al-Moqaddasi, p. 282; Frye, 1954, p. 16-20]. In this connection is of interest the legend about construction of the city Bukhara and a of Shir-i Kishvar (Tardu-Kagan), a son of the Supreme Türkic Kagan Kara Churin and the father of Il-Tegina (Parmuda), as its ruler [Narshahiy, p. 16-17]. Il-Tegin (Parmuda, Nili-Khan), who was married to the Chinese princess, built a Buddhist temple in the Ramitan, where was his summer residence. It is known that about 590 AD the Chinese princess from the house of Chjou, preparing anti-government plot against the emperor from a dynasty Sui, to get support of the Türks, had concluded a union with the Bukhara ruler Nili-Khan (Parmuda) [Bichurin, 1950, vol. 1, p. 240; Gumilev, 1969, p. 136]. Precisely to this time apparently belongs the conclusion of the marriage contract and arrival of the Chinese princess to Bukhara, and also the construction of a Buddhist temple in Ramitan. The Chinese princess by name Syan-shy has given birth to a son by the name Daman (Taman). Soon afterwards Nili-Khan died, and she has married his younger brother by name Poshi dele (Tegin). About the 600 AD Poshi departed to the Chinese court together with Syan-shy, and was detained there as a hostage. The Chinese princess Syan-shy did not return to Bukhara and remained in China up to the end of her days. After the death of Nili-Khan to throne was raised his son from Syan-shy by name the Daman (Taman), with the title Nigü Chulo-Khan. In the 614 Chulo-Khan married a Chinese princess Sin-i, and served in the Chinese emperor army. In the 618 he perished in the war with the Eastern Türks [Bichurin, vol. 1, p. 279-283]. Possibly name Buhar was originally applied to this temple in the Ramitan, and then was extended to the whole area and its new capital in the place of the modern Bukhara. On the middle of the 19th century 84 city map of the Bukhara and its vicinities, is mentioned the tomb of the son of the Chinese king (qabri-i pisar-i padishah-i Hita) [Muhamedjanov, 1965, p. 31 - 42], from which follows that possibly the Chinese princess resided in Bukhara, where, hence, also was her ‘‘temple of idols’‘. In this connection is of interest the Samanids’ mausoleum in Bukhara, which construction belongs to the 9 - beginning of the 10th centuries [Saidjon, 1927 p. 52 - 53]. The plan of the mausoleum building is a cube topped with a semicircle (dome), with a centric composition, 4 entrances with completely identical facades [Pugachenkova, 1968, p. 119]. The architectural image of it is an embodiment of a cosmogram: square - circle [Bulatov, 2005, p. 36]. It is supposed that Samanids’ mausoleum repeat the form of the early feudal fortress [Pugachenkova, Rempel, 1958, p. 67] or a pre-Islamic memorial ked, widespread in pre-Islamic Sogdian architecture [Pugachenkova, 1962, p. 52]. According to another opinion, the building of the mausoleum represents Sabian temple - observatory, devoted to the Sun cult, from where the movement of the sun was observed. [Bulatov, 1976, p. 71 - 77; Bulatov, 2005, p. 36]. Near the Samanids’ mausoleum were excavated remains of an older building with a floor decorated with concentric circles of bricks. It was again suggested that this building was connected with a solar cult [Bulatov, 1976, p. 91]. In our opinion, plan of the mausoleum is exact reproduction of a Buddhist mandala [Mandala, p. 140; Arapov, 2002, p. 13]. One more clue pointing to the connection of this monument with Buddhism is the symbol on the walls of Samanids’ mausoleum in Bukhara. This symbol is a complex geometrical composition consisting of built-in squares and a circle (medallion) in the middle [Pugachenkova, Rempel, 1960, p. 67; Pugachenkova, 1968, p. 121; Bulatov, 1976, p. 85], also represents a cosmogram of the decreasing and increasing universe [Bulatov, 2005, p. 36]. 84 The name of the author of this map, stored in the archive of the orientalist P. I. Lerh (1827 - 1884), remains unknown. Supposedly it was made by the Uzbek scientist and writer Ahmad Donish (1827 - 1897), which however is contradicted by some indicators [Muhemmadjanov, 1965, p. 31 - 42; Suhareva, 1976, p. 132 – 148]. Squares and disks are also present in the Varahsha [Rempel, 1961, p. 152]. Precisely the same symbol is represented in the wall murals with images of Buddhist legends in the cave complex Dunhuan, which was one of the largest Buddhist cult centers in the Central and Eastern Asia of the Early Middle Age epoch [Arapov, 2002, p. 120 - 125]. In antiquity the ornaments furnishing the buildings had magic character, serving as protection or symbols of permanence of the building, and of the well-being of their inhabitants [Allatkina, 2004, p. 32]. The ancient cult building, which remains were excavated near the Samanids mausoleum, could be the temple constructed by Il-Tegin for the Chinese princess. It is known that Il-Tegin (Parmuda) was an adherent of the Buddhism and with him is reputed the penetration of the Buddhism to Bukhara [Stavisky, 1960, p. 115], and also construction of two Buddhist temples in Kashmir, where he was sent as a viceroy in the 588 [Chavannes, 1903, p. 157]. Between 759 and 764 a Chinese traveler U-kun saw in Kashmir and Gandhar among the Buddhist relics a few temples, founded in the 6-7th centuries by the Türkic rulers and members of their families, these buildings stood there for a century. In the Kashmir was a ‘‘hatun temple”, founded by Türks, and a temple Ve-li-te-le, i. e. Ve-li-Tegin or Il-Tegin, which was a son of Türkic king [Chavarmes, 1903, p. 198, 242-245; Litvinsky, Zeimal, 1971, p. 120]. In the 11th century in the northern and east part of Kashmir lived Türks who professed Buddhism [Biruni, 1963, p. 202-203]. However, name Puhar (pwkhr) first time appears on the coins of the 4-5th centuries [Smirnova, 1982, p. 143; Naimark, 1995, p. 37]. Consequently, probably during the Chionite and Ephtalite times was a Buddhist temple, from which the whole area received its name. Supposedly, at least the ruling dynasties of the Chionite and Ephtalite confederations were Türkic-lingual [Frye, 1991, p. 49]. In the murals in Bandian fortress (3 kms northwest from Dargaz) in the north of the Khurasan province in modern Iran are depicted fight scenes and a victory of one of Sasanid kings over the Ephtalites. The downed enemies, laying face down, have elongated almond-shaped eyes and Mongoloid face type [Rahbar, 1998, p. 236-237]. The early Arabic authors held Ephtalites (al-haital, pl. al-haiatila) to be the Türks [al-Beladsori, p. 403]. The start of the Türkic penetration in Tocharistan and Khurasan happened long before the formation of the Türkic Kaganate, when the Türks were in the Kidarite, Chionite and Ephtalite military - tribal confederations. On the Ptolemy geographical map of the Middle Asia is recorded a people Komeds (Comedae), living in the headwaters of the river Oxus, i. e. Amu Darya [Tabulae Georaphicae]. Their descendants were the medieval Kumidji Türks (singular Kumidj - Translator’s Note) [Kamoliddin, 2003, p. 98-108]. One of the most ancient Türkic tribes that settled in Tocharistan and Khurasan were Halachies [Zeinalov, 1972, p. 79]. In the beginning of the 8th century they ruled the Seistan [Masoudi, vol. 5, p. 302]. In the 10th century the descendants of the Ephtalites were believed to be the Türks of the tribe Halach and Kandjina, i. e. Kumidjies of the Tocharistan [al-Khowarezmi, p. 119; Frye, Sayili, 1945, p. 315]. In the 11th century Halachies were a significant part of Gaznevids army, and the Afghani tribes Hildji or Gilzaj are believed to be their descendants [Kudryavtsev, 1972 , p. 176-177]. In The 4-5th centuries the Bukhara oasis was in the sphere of the Kushan-Sasanid monetary circulation [Naimark, 1995, p. 36], which formed in the period between 368 and 388 AD after the Sasanids occupied Tocharistan [Lukonin, 1967, p. 26]. The northern border of the Kushan state passed through the Nahshab area, i. e. in immediate proximity of the Bukhara oasis [Masson, 1975, p. 42-49]. There are reasons to assume that the Kushan sphere of political influence also spread to Bukhara. The Sogdian inscriptions on one of the earliest Bukhara coins from the Varahsha read twgr gwb ‘‘Togar yabgu‘‘, which allows to posit that in the 3rd- 4th centuries in the Varahsha was reigning a Tocharian prince [Smirnova, 1982, p. 143]. The Buddhism, apparently, did not have a wide circulation in the Bukhara oasis, because Qian Tszan, passing about 630 AD through the Pu-ho (Bukhara) possessions, did not note a presence of any Buddhist relics or adherents of the Buddhism [Beal, 1990, p. 45]. The major part of the Early Middle Ages Sogd population professed Mazdaism. But there also were other religious communities, including Buddhist, because since the Kushan time the Buddhism was widely diffused in almost all areas surrounding Sogd (Merv, Fergana, Jety-su, Tocharistan, etc. ) [Lunin, Usmanov, 1990, p. 65-67]. About 630 AD the Chinese pilgrim Qian Tszan has recorded a presence in the Samarkand (Sa-mo-kien) of two Buddhist temples, which were in a state of desolation [Beal, 1990, p. 45]. One of the city quarters of the medieval Samarkand was called Ushtabdiza [An-Nasafi, p. 118; An-Nasafi, p. 23; as-Samani, vol. 1, p. 265], in which name is possible to see a Sanskrit word stuppa [Kamoliddin, 2003, p. 123-124]. In the Samarkand province is mentioned rustak Sandjarfagan [al-Istakhri, p. 320; Ibn Haukal, p. 496, 498; al-Moqaddasi, p. 266, 279], where can be seen a Sanskrit word sangharama (a Buddhist temple). It is supposed that the Samarkand namozgoh (Arabic al-musalla), i. e. the suburban mosque for holiday prayer, located west from the Afrasiab, was built in the place of a Buddhist temple (behar), after which was called the western gate of Samarkand, the Naubehar gate, located in the southern end of the western city wall [Vyatkin, 1926, p. 12, 18]. There are indications that the Samarkand cathedral mosque, located west from the citadel, was also constructed in a place of the pre-Mongolian time idolatry sanctuary [Kandiya, p. 150]. In the Sanzar valley (Samarkand province) was discovered a cult building of the 1st-3rd centuries AD, with large bronze statues of the Buddha surrounded by bronze figures of sitting lions [Litvinsky, 1975, p. 191-198]. About the existence there of the Buddhist temple, active in the 5-7th centuries, tells the inscription made 15 years after its destruction [Lapierre, 1998, p. 9]. When Kutaiba ibn Muslim captured Baikand, he found in one of its temples a silver idol appraised in 4 thousand dirhems [Frye, 1954, p. 45; Narshahiy, p. 45], and in the place of the Makh mosque in the Bukhara in the 10th century still two times a year were sold idols [Frye, 1954, p. 21; Narshahiy, p. 26]. In the fortress Saryk-tepa in the Jakkabag district (Kashkadarya province) were found one clay and one terracotta plaques with images of Buddha [Lunin, 1989, p. 57-60; Lunin, Usmanov, 1990, p. 65-67]. In the 12th century in Nasaf is mentioned a whole family with nisba ar-Rahibi, formed from the Arabic word rahib that means ‘‘(Buddhist) monk’‘ [as-Samani, vol. 6, p. 59]. 85 V. A. Livshits believed that in Sogdian language the Sanskrit word vihara could not take the form pukhar (Livshits, Kaufman, Diyakonov , 1954, p. 150; Frye, 1956, p. 117). Among the ambassadors who arrived in the 732 to the Orhon headquarters to participate in the Kül-Tegin funerals, is mentioned Ogul-Tarhan, who arrived from the people of a Buharian ulus (buqaraq ulus buduri) [Malov, 1951, p. 19-20; Amanjolov, 2002, p. 153-169]. Though here the word buqaraq means a name of the people, instead of the name of the country, in it possible to note the ancient Türkic form of this toponym (Buqar), which could be constructed from the Türkic root (buqa ‘‘bull’‘), and had preserved in the modern Mongolian language [Frye, 1956, p. 117]. The word ulus, accompanying the word buqaraq in the ancient Türkic text, also has a meaning ‘‘location of Buddhas’‘ [Murzaev, 1984, p. 575]. In Southern Siberia is toponym Pukhar, which in the Enisei languages means ‘‘island’‘ [Murzaev, 1984, p. 470]. The earlier of Bukhara coins (6th century) contain an inscription in the Horezmian runiform script which reads sdq pqrq ‘‘Shad of Bukhara’‘ [Muhammadi, 2000, p. 91]. To summarize, there is sufficient reasons to posit that the name of the Bukhara city comes from the Türkic word buxar, which means ‘‘Buddhist temple’‘. The emergence of this name could be connected with construction there a Buddhist temple during Chionite or Ephtalite periods. In the 6th century the Türkic ruler of Bukhara Il-Tegin (Parmuda), son of Tardu-Kagan (Shir-i Kishvar), who was an adherent of the Buddhism, built there another Buddhist temple for the Chinese princess. This temple was located not in the Bukhara, but in Ramitan, where was his residence, and where, hence, the idols the Chinese princess brought from China have been placed. After that the city and its area received this alien to Sogdian language Türkic word Buhar, after this temple. After the transfer of the ruler residence to city Numidjkat (Bumidjkat) that name began to be applied to the new city, where probably a new idolatry temple was built. At the same time, still in the 10th century also continued to be used the Sogdian name of this city, Bumidjkat or Numidjkat. 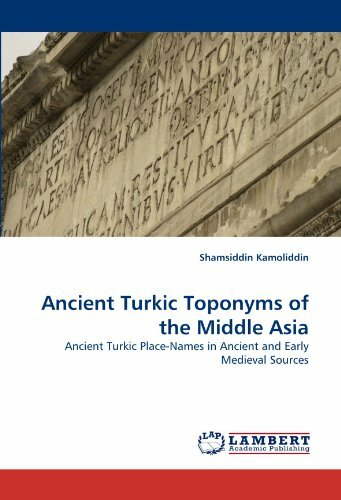 During the Early Middle Age epoch the ancient Türkic names constituted an essential part of the Middle Asia toponyms. The Türkic names are found not only in the northern, but also in the central and southern areas of region, including the Bukhara oasis. The lake Samdjan (=Sam-khvash, Avaza, Bargin-i Farakh), located near Paikand [al-Istakhri, p. 306; Hudud al-Alam, p. 28а; Hudud al-Alam, p. 56, 73], in the 10th century also had Türkic names Karakul and Dingiz (Dinkiz) [Frye, 1954, p. 19, 119, pl. 95; Narshahiy, p. 25; Lurie, 2004, p. 192]. According to the Ibn Haukal map, the Sogd river (Zarafshan) ran into lake Harahaza [Ibn Haukal, p. 462, map; Fedchina, 1967, p. 11]. The same name is shown on the Ptolemy map in the form Haraharta (Characharta) [Ptolemy, Tabulae Georaphicae]. This shows that in the Bukhara province in the beginning of our era alongside with Iranian-lingual population lived both Türkic-speaking, already then this lake had a Türkic name. The name of the Varan quarter in Bukhara, and likewise the name of the city Valvalidj or Varvaliz in the Tocharistan [al-Istakhri, p. 275; al-Moqaddasi, p. 346], is linked with the ethnonym Avar [Togan, 1969, p. 284]. In the Bukhara province on the border with the Türks is recorded a settlement Aushar (Afshar) [al-Moqaddasi, p. 282], which name is formed from the Türkic ethnonym Afshar [Kasgarli, p. 56; Kashgari, vol. 1, p. 89]. On the road from Bukhara to Khurasan during the Middle Ages was a city Baikand or Paikand [al-Istakhri, p. 313-315; Hudud al-Alam, p. 4а, 96, 226; Hudud al-Alam, p. 113; al-Moqaddasi, p. 49, 266], which name comes from the Türkic word bai/pai/mai, which is derived from the name of the goddess Umay, from a Tengrian pantheon of the ancient Türkic religion 86. Per Biruni, Baikand was also called Dizruyin [Biruni, 1973, p. 470]. Per Kashgari information, Baikand 87 was called Dizrutin and was a westernmost city in the country of Türks [Kashgari, vol. 3, p. 164; al-Kasyari, vol. 2, p. 225]. In the 11-12th centuries in the East Turkestan also was a city named Baikand [Djaparidze, 1984, p. . 28]. On the same road is mentioned a settlement Miyan-kal (miyankal) [al-Istakhri, p. 337; Ibn Haukal, p. 517; al-Moqaddasi, p. 343, 345], the name of which contains a topoformant -kal (-gal), widely spread among both Iranian, and Türkic toponyms. 86 The Türkic word bai, like its variation pai, is derived from a root may which, in turn, is the reduced form of the ancient Türkic name Umay (from a Sanskrit ima ‘‘mother’‘), with initial meaning ‘‘ancestor, patroness, matriarch, pra-mother’‘, and then, during an epoch of weakening of the matriarchate, it gradually acquired other meanings ‘‘elder, rich, respectable, full’‘. [Kudachina, 1980, p. 83-86; Stebleva, 1972, p. 215; Nafasov, 1988, p. 116] (this line of inference, ima => Umay, presupposes a far-reaching Indo-Aryan Sanskrit cultural influence onto the primeval core of the Türkic beliefs, a primeval symbiosis leading to a syncretism, which, if real, would have been manifested throughout the primeval Türkic culture - Translator’s Note). 87 In the Kashgari text Jankand [Kashgari, vol. 3, p. 164]. However the R. Dankoff's translation accepted reading Baykand [al-Kasyari, vol. 2, p. 225, Boboyorov, 2006, p. 23 – 25]. In the Bukhara province is also mentioned settlement Barshan (Barskhan) [as-Samani, vol. 2, p. 153] in which name can be noted a Türkic title Khan. This name, like names of rabat Bars (Baris) in Khurasan [al-Moqaddasi, p. 348], city Barskat (Bariskath) in the Shash province [as-Samani, vol. 2, p. 29] and the city Barshan (Barskhan) on the bank of the lake Issik-kul [al-Moqaddasi, p. 48, 263; Hudud al-Alam, p. 36, 18а, 24а; Hudud al-Alam, p. 98] 88, is formed from the Türkic name Bars (Baris). 88 Ibn Hordadbeh mentions it in the form Nushchdjan. [Ibn Khordadhbeh, p. 29; Ibn Hordadbeh, p. 65]. A military leader for Ismail ibn Ahmad as-Samani was Bars al-Kabir, first a gulyam, and then a ruler of Djurdjan, Tabaristan and Rei [Ibn al-Asir, vol. 7, p. 209; vol. 8, p. 3]. One of the participants of the Caliph’s embassy to Bulgar was a certain Bars (Baris) as-Saklabi [Collection, SPb. , 1885, p. 391; Ibn Fadlan ‘‘Travel’‘, p. 55, 72]. The ancient Türkic runiform monuments of Talas mentioned Bars, Kara Bars and Okul Bars [Malov, 1959, p. 92, 97, 100]. In the vakfnam Tamgach-Khan Ibrahim (11th century) is mentioned the name Bars-Tegin [Bosworth, 1968, p. 451]. In the 10th century the Guzz Türks, in the lower course of Syr-Darya, with Samanids permission settled in the Zarafshan valley, and resided in the Nur area and in the vicinities of Bukhara [Tarih-i Baihaki, p. 681; Baihaki, p. 823; al-Husajni, p. 164]. The descendants of these Oguzes are the Turkmens who live to this day in the Nurat area in the Bukhara province [Shaiiyazov, 1973, p. 5]. Settlement (al-karsha) al-Djadida, i. e. the “new settlement”, located in the vicinities of Bukhara, was founded in the 10th century by the Turkmen immigrants from Djand [as-Samani, vol. 3, p. 319]. Subsequently, this settlement became a part of the city, and was called Turk Djandi [Suhareva, 1976, p. 91-92]. On the road from Bukhara to Khoresm in the 10th century are mentioned settlement Shuruhan (Surukhan) [al-Moqaddasi, p. 343] and rabat Tash (Tas) [al-Moqaddasi, p. 343, 345], which names can be connected with a name of the Samanid dignitary hadjib Abu-l-Abbas Husam ad-Davla Tash [Ibn al-Asir, vol. 9, p. 4, 5, 10, 11, 12]. Ftom the Türkic language comes etymology for such toponyms in the Bukhara area as Birmas [as-Samani, vol. 2, p. 361], Suthan [as-Samani, vol. 7, p. 184], Sutikan [as-Samani, vol. 6, p. 42], Zimlik(а) (Zimliqa) [as-Samani, vol. 6, p. 299], Burzun Guzkand (Yuzkand), etc. [New page from A. Z. Validi’s life, 2001, p. 16; Boboyorov, 2005, p. 127]. In the Bukhara province are also mentioned rustak Bardak (Bardaq) [Ibn Haukal, p. 485], settlements Fashuk (Fashuq) [as-Samani, vol. 9, p. 228] and Karagun (Qaragun) [al-Istakhri, p. 334; Ibn Haukal, p. 517; al-Moqaddasi, p. 345], and the city Garkand (Yarkand) [Ibn Haukal, 488], which name contains the Türkic topoformant -kand [Lurie, 2003, p. 199]. The name of the settlement Turvaha (Turwakha) or Turaha (Turakha) in the Bukhara province [as-Samani, vol. 3, p. 37; vol. 8, p. 237] is derived from the Türkic word turag ‘‘residence’‘ [DTS, p. 587; Boboyorov, 2005, p. 126]. In the name of the settlement Kukshibagan (Kukshibagan) [Ibn Khordadhbeh, p. 26; Ibn Hordadbeh, p. 64, 176] or Kok (Kuk), where the Türkic Hakan equipped his army for a campaign [Kodama, p. 203], can be noted a Türkic word kuk (dark blue). The name of the settlement Bitik in the Farabr area [Frye, 1954, p. 6; Narshahiy, p. 15], which has etymology from Ancient Iranian baidi (a stream of water) [Tremblay, 2004, p. 122], possibly also trace its etymology from the ancient Türkic word bitik ‘‘book’‘, ‘‘letter’‘, ‘‘inscription’‘ [Kasgarli, vol. I, p. 68, 137, 198, 253, 321; Kashgari, vol. 1, p. 101, 171, 231, 295, 365]. The settlement Vardana in the Bukhara province is called ‘‘fortress on border with Turkestan’‘ [Frye, 1954, p. 16; Narshahiy, p. 18, 23]. Abu Ibrahim Abd Allah ibn Handja ad-Dahfanduni (died in 273/886-87) was nicknamed Djamuk and originated from the settlement Dahfandun in the Bukhara province[as-Samani, vol. 5, p. 289], he was from a notable Türkic clan Djamuk [Smirnova, 1963 (а), p. 26]. The Bukharian ambassador who in 732 came to the Orhon capital for Kül-Tegin funerals had Türkic name Ogul-Tarhan [Amanjolov, 2002, p. 153-169]. Thus, the historical and linguistic analysis of the historical toponyms in the Bukhara oasis shows that Türkic names are one of the most ancient in this territory, and that, in turn, demonstrates that Türks lived there from an extreme antiquity, being a part of the local settled population. In the Sogdian documents from the mountain Mug (beginning of the 8th century) are mentioned settlements Almalyks and Sary in the upper part of the Zarafshan valley [SDGM, 1963, p. 101, 107]. In the same documents is mentioned toponym Akhshikat [SDGM, 1963, p. 101-102], with etymology ‘‘white city’‘ [SDGM, 1963, p. 30, 101; Koraev, 1978, p. 30], probably from the Türkic ak (su) and Sogdian -kat. A kishlak (village - Translator’s Note) with a name Hushekat exists till now in the Anni district of the Sogdian province of Tadjikistan [Hodjaeva, 2003, p. 34]. This toponym is also matching the name of the Avestan mountain Ishkata [Bushkov, 1998, p. 62-63]. Türkic toponyms were dispersed on all headwaters of the river Zarafshan [Khromov, 1975, p. 20] and valley JAgnoba [Khromov, 1967, p. 78]. From the Türkic language comes etymology for such Sogdian toponyms, as Sagardj [as-Samani, vol. 8, p. 10-11], Guzkand, Yuknak, Savindj, Barsun, Barmasun, etc. [New page from A. Z. Validi’s life, p. 14]. In the eastern part of the Kashkadarya valley during the Middle Ages was a city Kesh (Kash, Kishsh, Kise) [Ibn Hordadbeh, p. 64, 68, 69, 77; Hudud al-Alam, p. 113], whith the name’s etymology from the Sogdian word kis (‘‘harrow‘, ‘‘ditch” [Tremblay, 2004, p. 128]), or from the word kash/kush, a geographical term of the Iranian origin meaning “hill into which a river runs, and flowing around it, splits into two channels” [Nafasov, 1988, p. 96]. The name of the settlement Kish in the Azerbaijan has etymology of ‘‘place between two mountains, whence flows water’‘, and is derived from the ancient Türkic verb kesh-/kish-, meaning ‘‘to flow‘, ‘‘to outflow‘. It can be concluded that the name of the city Kesh in the Kashkadarya valley has the same origin. The ethnonym Kash or Kashk is also mentioned in the Caucasus during the Middle Ages [Masoudi, vol. 2, p. 45, 47]. The name of the settlement Naukad Sava in the Nasaf area [An-Nasafi, p. 59 a; al-Samani, f. 571 R] can be connected with the proper name Sava. The Arabic sources call Shaba the Supreme Türkic Kagan who fought against Sasanids [Ibn Khordadhbeh, p. 40], and the Persian sources call him Sava-shakh [Gumilev, 1969, p. 115, 132]. Sava or Shava (Sawa) is a Baktrian title for ‘‘king’‘, and it belonged to Chol-Kagan (Shir-i Kishvaru) [Harmatta, Litvinsky, 1996, p. 371; Frye, 1956, p. 122], who before becoming a Supreme Kagan, was for 20 years a ruler of Bukhara, and he founded there a few settlements [Narshahiy, p. 16-17; Frye, 1954, p. 8], and in the 588 he was sent to the Tocharistan and Gandhara, which were members of the the Türkic Kaganate [Chavannes, 1903, p. 157]. This shows that Sava-shakh founded settlements not only in the Bukhara oasis, but also in the Nahshab area. The second component in the name of the settlement Naukad Hurahar (or Harahur) in the Nasaf area [al-Samani, f. 571 R] can be connected with the name of the Ustrushana ruler (in 119/737) Khara-Bugra, whose father was Khan-Ahury, the grandfather of Kavus and great-grandfather of Haidar, known as al-Afshin [at-Tabari, ser. II, p. 1609, 1613, 1964; ser. III, p. 1066]. Alternatively, it can be also connected with the name of the lake Harahaza on the Ibn Haukal mapa [Ibn Haukal, p. 462, map; Fedchina, 1967, p. 11] and the name Haraharta (Characharta) on the Ptolemy map [Tabulae Georaphicae] which shows the lake Karakul near Baikand. 89 Toponym Kish is mentioned in the composition of the Albanian historian Moisei Kagankatvatsi (7th century) in connection with the events of the 70es AD [Molla-zade, 1979, p. 170]. In the Kesh area is mentioned settlement Didaki, with the name, like the toponyms Mirki and Birki, is formed with the topoformant -ki [al-Idrisi, vol. 4, p. 492]. One of rustaks in the medieval Kesh carried the name Kashk, and another was called Kashkrud [Ibn Haukal, p. 502]. So also was called the river in the Kesh area. It is also thought that the hydronym Kashkrud means ‘‘Kesh river”, and the modern name Kashkadarya is a Türkic form of the same name [Ismoilov, 1987, p. 53]. There is also an opinion that name Kashkadarya comes from the Türkic word kashka ‘‘upland‘, ‘‘mountain’‘, ‘‘mountainous’‘ [Nafasov, 1988, p. 242]. In that case the same root should also be noted in the base of the Sogdian form of the name of this river, Kashkrud. The topo-root kashka in these two hydronyms can be also related with the with the title - ethnonym Kashka, meaning ‘‘leader of a tribe’‘ and widely represented in the Jeti-su and Southern Siberia toponyms [Karatayev, 2003, p. 102-103] (E. Slavic/Russian version “koshevoy” - Translator’s Note). During the Middle Ages in the Southern Sogd is mentioned rustak called Huzar [as-Samani. vol. 5, p. 102; vol. 7, p. 70] with the same named river [Ibn Haukal, p. 502] and city, which ruler was Türkic dihkan by name Sabukra [at-Tabari, ser. II, p. 1148]. The name of this rustak is formed from the geographical term huzar, which means ‘‘constriction in the river’‘ [Murzaev, 1957, p. 245; Nafasov, 1988, p. 9], and it also corroborates the evidence of Yakut [Yakut, vol. 2, p. 432]. Yakut also derives it from the word hazr, which means ‘‘squint’‘ [Yakut, vol. 2, p. 924]. A district called Huzar is also mentioned in Turkestan [Kashgari, vol. 1, p. 389]. The names of rustaks Aru and Argan in the Kesh area [Ibn Haukal, p. 502], are probably connected with an ethnonym Argu/Argyn/Argun/Argan [Kashgari, vol. 1, p. 65, 94, 114, 148, 308; vol. 2, p. 30, 54, 64, 71; vol. 3, p. 167, 184, 245, 254, 285], or with a Türkic word arqa ‘‘back side’‘ [Kashgari, vol. 1, p. 144, 148, 157] or agi ‘‘north’‘ [Imanalieva, 1990, p. 88-89]. In the Southern Sogd is mentioned city Iskifagn (Sakifagn) on the road from Nahshab to Termez [al-Istakhri, p. 343; Hudud al-Alam, p. 114; al-Moqaddasi, p. 268]. Its name has etymology from the Türkic word iski (old) and a Sogdian topoformant -fagn (temple) [Smirnova, 1971, p. 101], it was also preserved until present in the form Eski-bug [Bartold, 1963, p. 189; Nafasov, 1988, p. 223]. The name of the settlement Kadjar in the Nasaf area [as-Samani, vol. 10, p. 309] is composed from the Türkic ethnonym Kadjar [Nafasov, 1988, p. 99]. The name of the settlement Sakabadyaz [as-Samani, vol. 7, p. 11] is composed from the Türkic word paz ‘‘steppe, plain’‘ [Nafasov, 1988, p. 69, 128]. In Kashkadarya valley is a kishlak named Sairam [Nafasov, 1988, p. 162]. During the Middle Ages the same name had the city located on the middle course of Syr-Darya [Kashgari, vol. 1, p. 111; vol. 3, p. 191]. This name has etymology from the Türkic word sairam (saryam), meaning ‘‘shoal’‘ [Kashgari, vol. 3, p. 191, 323]. The name of the settlement Ibsan in the Nasaf area [as-Samani, vol. 1, p. 396] consists of the two components: Türkic ib (ip, in, ev) and Sogdian san which means ‘‘house on a hill’‘ 90. 90 The etymological analysis of this toponym belongs PhD in History K M. Iskhakov, to whom we address our gratitude. The Sogdian topoformant –mitan (-misan) has a Parthian origin, it is especially widespread in the medieval toponyms of the Bukhara, Khoresm and Merv, and is also found in Samarkand, Southern Sogd, Fergana and other areas of the Middle Asia, it comes from the Ancient Iranian word maethana, which means ‘‘habitat”, ‘‘habitation”, ‘‘house” [Khromov, 1974, p. 10], but in its base it has a considerably more ancient origin, and goes back to the remote times of a primitive communal system when this term also had ethnonymic meaning, preserved until present as one of the tribal names of Karakalpaks and Uzbeks (Muiten) [Tolstova, 1978, p. 13; Karaev, 1991, p. 90]. Supposedly, the old name of Bukhara was Navakmetan [Grene, 2006, p. 35] (Ethnonym Muntyan and Muntenia province in Rumania - Translator’s Note). In the later sources are mentioned the Türkic toponyms formed with the help of the Sogdian topoformants, testifying that they have arisen and existed during the Early Middle Age epoch . So, in the Samarkand documents is mentioned the settlement Kabamitan in the Kashkadarya valley [Samarkand documents, p. 67-68], formed from the Türkic word kaba (cave) and Sogdian - mitan (temple, habitat) [Murzaev, 1980, p. 78; Lurie, 2004, p. 193]. In the al-Mukaddasi composition all the lands located north from the Amu Darya are called al-Haital [al-Moqaddasi, p. 261]. So the Arabs called the Ephtalites, people of Türkic origin [Tolstova, 1978, p. 14], who in the 5th century founded their state in the Middle Asian territory and defeated Sasanids three times. Before the Arab conquest Ephtalites mainly lived in the southern areas of the Middle Asia, in Tocharistan and partially in Khurasan [Harmatta, Litvinsky, 1996, p. 367-401]. During the Middle Ages the name of the city Yaftal in Badahshan was connected with their name [al-Samani, f. 601 V; Yakut, vol. 4, p. 1023]. The city with this name also existed during the next centuries [Babur-name, p. 207], down to the new time [Minaev, 1879, p. 4], and still stands till now in the same-named valley north from the city Faizabad in Afghani Badahshan [Gumilev, 1959, p. 129-140]. Near the city Farabr on the right bank of the Amu Darya during the Middle Ages was a settlement Bitik [Narshahiy, p. 15] etymology of which name comes from the Türkic word bitik, meaning ‘‘inscription’‘ or ‘‘book’‘ [Kashgari, vol. 1, p. 231, 295, 365]. On the road from Bazda to Caliph was an intermediate station Balkhan [al-Moqaddasi, p. 27, 343] in which name can be seen a Türkic title khan. In the vicinity of Nahshab is mentioned a quarter (mahalla) al-Urdu, with a residence of Sultan Tarmashirin [Ibragimov, 1988, p. 84].